I'm so excited to show you this wedding. As a Norwegian wedding photographer I really love to travel to other countries and experience how things are done there. 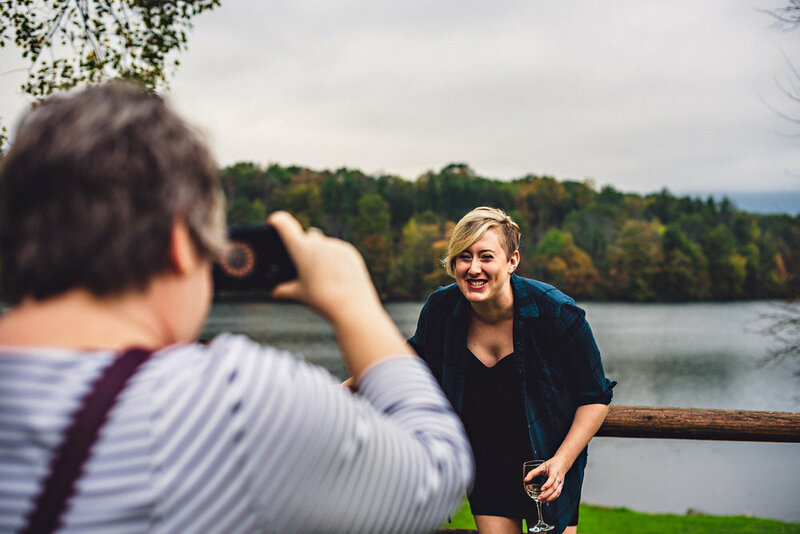 Sam and Brian actually met at Trout Lake when they both worked there at summer camp, which makes this location even more special for their wedding. Mixed guests that doesn't know each other? Make a friendship game! This game was invented during the summer camp days and was called Huggie Bear or something. Everyone gathered on the lawn and someone called "Huggie Bear 5!" or "...2!" or "...4!" and everyone had to gather in groups of the respective number that was called. The ones who were left out lost. It went on until there was a winner. They actually got married on the West coast prior to this wedding on the East coast because of friends and relatives spread around. So instead of a second ceremony, the whole wedding party walked around the premises while Sam and Brian told stories about where and how they met during the summer camp. Super cute, different and very fun. It brought all the guests closer to their story which I found really awesome! "How much time should we set aside for portraits?" A common question I get asked a lot. There is exactly 24 minutes from the first to the last portrait according to the metadata in my cameras (images below this text). I have also produced similar results in even less time. It's all about trust and hanging out and having fun. ...oh and by the way, it's time to mention that I was second shooting this wedding with my awesome friend and fellow wedding photographer Peter Mackey. Go check out his work and follow him in social media. I also photographed his crazy family while I was in Pennsylvania. Yeah you heard right. I did a family shoot, but not in the ordinary way... Go check out the photos here (after you finish this blog post of course). Portraits in the dark. You want them. Let's sneak away for 3 minutes more. I always ask my clients if they want to come outside for something different. Something extra. I love playing in the dark and create something unique and playful. There was also an outdoor pool. No pun intended. The perfect ending to a wedding day? Are you looking for a wedding photographer for your awesome wedding? I have photographed weddings in many different countries so travel is not an obstacle at all. I really love to experience a completely new place where I have never been before. It's like a blank canvas ready to be painted.